It takes courage to dance slowly and Beth Gill’s New Work for the Desert is slow from start to finish. Slow enough to feel the light change, quiet enough to not see entrances from another direction, sad enough to remind you of death. 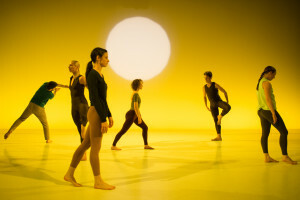 In an interview with Gia Kourlas, Gill is up front about being influenced by Trisha Brown, particularly her 1987 Newark—though I also saw glimmers of Trisha’s Locus (1975) and Set and Reset (1983). Gill has incorporated specific partnering moves from the genius last section of Newark, in which a very conscious sort of gravitational pull happens between people, e.g. hooking a foot around the back of another’s neck, clasping hands around the neck and rocking that person. The partner has to be passive enough to make these neat maneuvers possible, and Gill extends that passivity to its ultimate endpoint. What happens next is morbidly, bizarrely, beautifully tender. Thomas Dunn’s lighting creates the illusion of sky, earth, and distance. Till March 22. New York Live Arts. Click here for more info. Sequestered	Why Not Choose Silence?